Whilst we were flattered by TIME Magazine's decision to honour Darth Vader as one of the "Top 5 Twitter Accounts Filled With Evil Genius", we were equally disturbed to see a secretary and a superhero make the same list. It's time to set things right. I mean, an evil secretary? Come on. You can do better than that. Here are the top eight actual supervillains you need to follow right now. Seriously, if you ever want to see your [Circle appropriate: hamster/chocolate bar/husband] again, you'd better do it. The most iconic hero of this or any other age, the original man in black, Lord Vader sometimes takes time out from his busy schedule to tweet about the latest happenings in the Galaxy Far, Far Away. SAMPLE: "Just rolled over & hit the fire button instead of snooze. Right now millions of people are wishing I had gone to bed earlier." A lot of you know He-Who-Must-Not-Be-Blamed as the guy who hates Harry Potter. What you might not know is that he also hates other things too, like bad grammar, Kanye West and... well, people generally. SAMPLE: "For those watching the meteor shower tonight, if you happen to see a Dark Mark in the sky don't panic. Haha I'm kidding, definitely Panic." So much evil in such a small body, Stewie is the original Terror Baby. SAMPLE: "Whenever Meg feels depressed I always lend a hand. A backhand." CC is a busy man. Between social functions and trying to take over the world, it's amazing he has any time to tweet at all. What a guy. SAMPLE: "Aghhhh it's so hot outside. The hood was a bad choice." Not a supervillain, you say? We don't see any other evil organisations trying as hard to destroy your planet at the moment, do you? SAMPLE: "They say absence makes the heart grow fonder. We like pelicans and dolphins better already. #bpcares #doesntapplytowives"
The boss. Easily the funniest person on Twitter who would kill us in a heartbeat if we didn't say nice things about him. 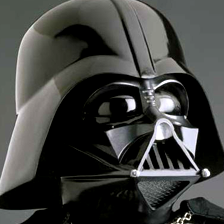 SAMPLE: I see @darthvader is complaining about my Farmville addiction again. At least I don't have Crazy Frog playing in my helmet all day. Gotham's Clown Prince of Crime is all about the jokes. And the occasional murder. SAMPLE: I love it when people put their heart into things, but I love it much more when I put peoples hearts into things, like meat grinders!! This is Vader after hours, after the cameras have stopped rolling and after quite a few drinks. Like, a lot. SAMPLE: Supposedly, after Obi-Wan killed Darth Maul he sent an email to Palpatine saying "there's a sale at the maul, everything is half off." Vader is a gateway drug to Twitter AND the Empire. He's really a swell guy once you get past the force chokes. Glad to hear that some people get it. Spread the good word! I would ask for consideration to this list. I mean, after all, I have a legacy to uphold. I am @mao_junior twitter puppet dictator and great grandson of mao zedong. I would ask not so kindly that you consider us, or we shall be first to send our killer alpacas to the core of the death star's center. And we all know that the death star's true weakness is an alpaca.